The concert will start at 3.15pm, and will be followed by tea and games in the garden. Manic idiot violinist Sid Bowfin brings you his uniquely brilliant hilarious take on the classics. The world’s finest music, peppered with the perfect silliness and showmanship seasoning. What could be better? Sid Bowfin is the latest creation of Adrian Garratt, the founder of the world’s funniest string trio Pluck. 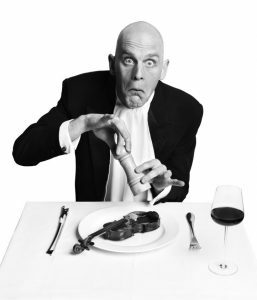 A world class violinist and clown, Adrian’s classical comedy acts have been seen by audiences all over the world, at events ranging from corporate dinners and private parties to international arts festivals. Watch classical music and comedy combine in a completely unique way – part recital, part stand up comedy, part clown routine. And he’s a master of improvisation. Keep up, audience. Come and celebrate Fathers’ Day with a truly unique treat for all the family!